I've always loved the idea of "Friendsgiving"--a Thanksgiving party meant to be shared with friends. While I think the idea originally started when groups of friends living too far from home started celebrating the holiday together, I now think that it's an added bonus to do both--regular Thanksgiving with the family, and a more casual, personalized party with your friends a few days before (or even after!) the big event. 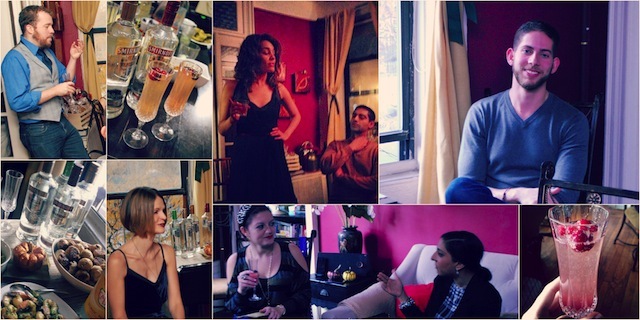 As part of my ongoing holiday entertaining series with Smirnoff, this past weekend, Eugene and I invited a few friends over to our apartment to sip cocktails and enjoy a menu made up mostly of appetizers and side-dishes--aka what everyone loves best about Thanksgiving anyway! The group included a great mix of old and new friends, like my friend Vanessa whom I've known since I was 14, and my new friend Hitha, a fellow blogger with whom I've chatted and shared a lot online, but had never actually met in real life until she and her lovely husband joined us for the party. My friends Irina, Maegan, Lara, and Topher, and my brother-in-law, Ilya, also rounded out the small, but lively group. I told everyone to dress up, and we gathered around my cozy living room piled up on chairs and couches, enjoying food and catching up. When guests arrived, I greeted them with our bubbly signature cocktail, which I call a Cranberry 75. 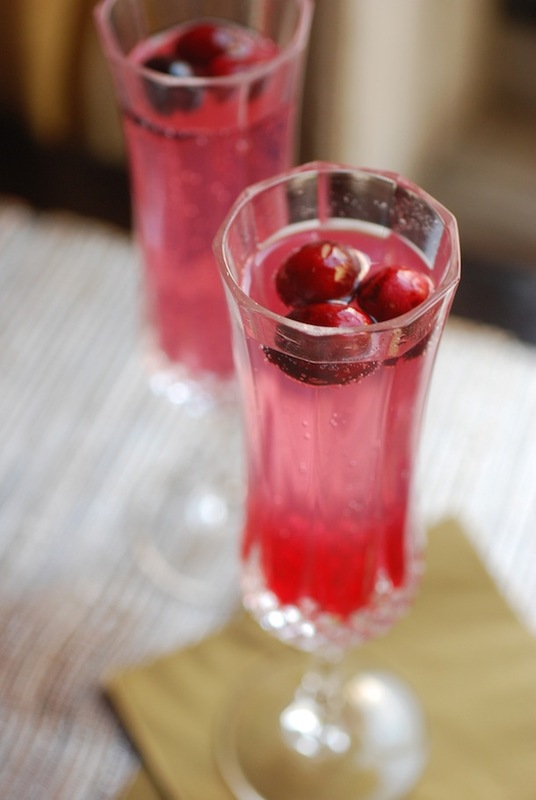 Based on one of my favorite classic cocktails, this one is made with a light and tart combination of Smirnoff Cranberry Vodka and sparkling white wine, garnished with a few fresh cranberries. 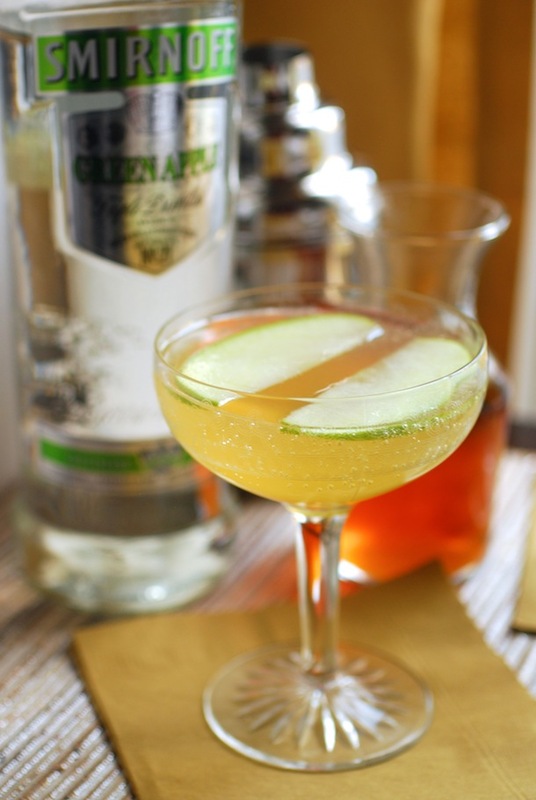 For those who don't like bubbly, I also mixed up Double Apple Spritzer Cocktails, using Smirnoff Green Apple Vodka, which has a crisp, fresh apple taste, seltzer, and sweetened with some of my homemade Apple Cider Simple Syrup. One of the best things about Friendsgiving is that you can really have fun with the menu, and aren't stuck serving dishes that you don't really like, just because "we've always served it." 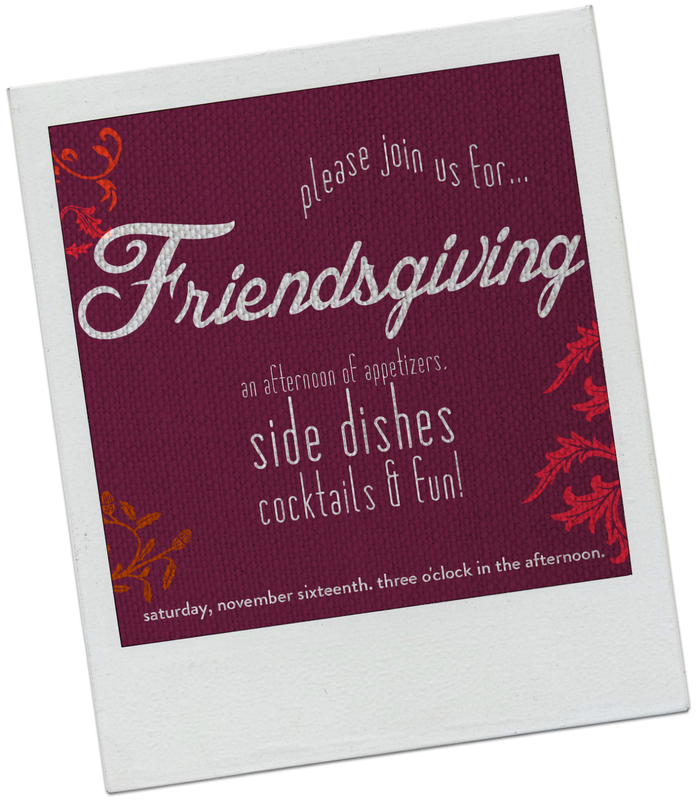 Friendsgiving is meant to be personalized and a little non-traditional, so don't be afraid to shake things up a bit! 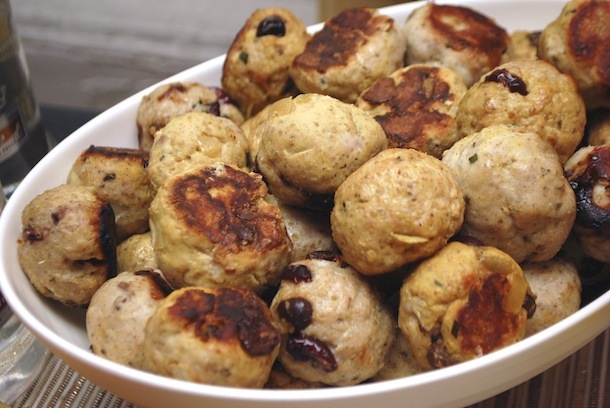 For my menu, I decided to just skip the hassle of roasting a turkey, and instead made a batch of Turkey Quinoa Meatballs served with Spiced Cranberry Orange Sauce. Since one of my friends is vegan, I also made a batch of Smokey Quinoa-Stuffed Mushrooms that actually ended up being a hit with everyone. There was a big cheeseboard (of course! 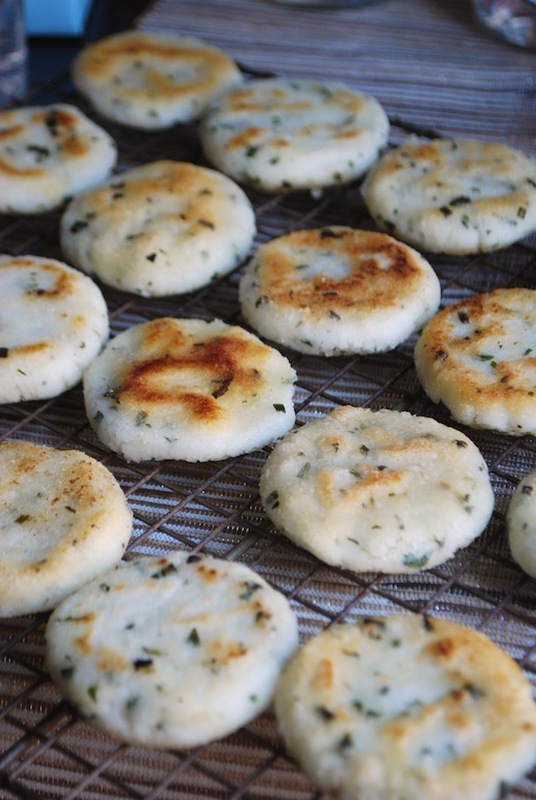 ), and some snacky things like Mini Chive & Cilantro Arepas for my gluten-free friends. 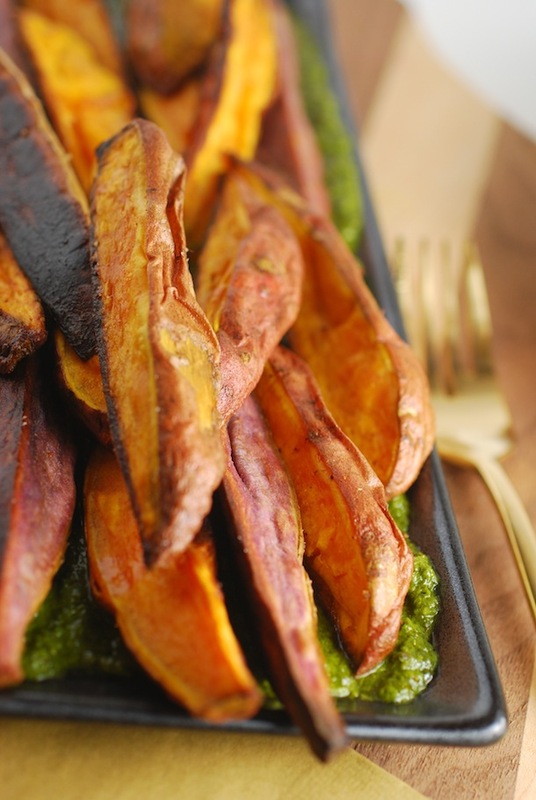 For sides, I served Roasted Sweet Potatoes with Italian Salsa Verde (a savory and spicy twist on the classic sweet potato side dishes). We also enjoyed a large bowl of Coconut Apricot Couscous, made with Israeli pearled couscous and dried apricots. 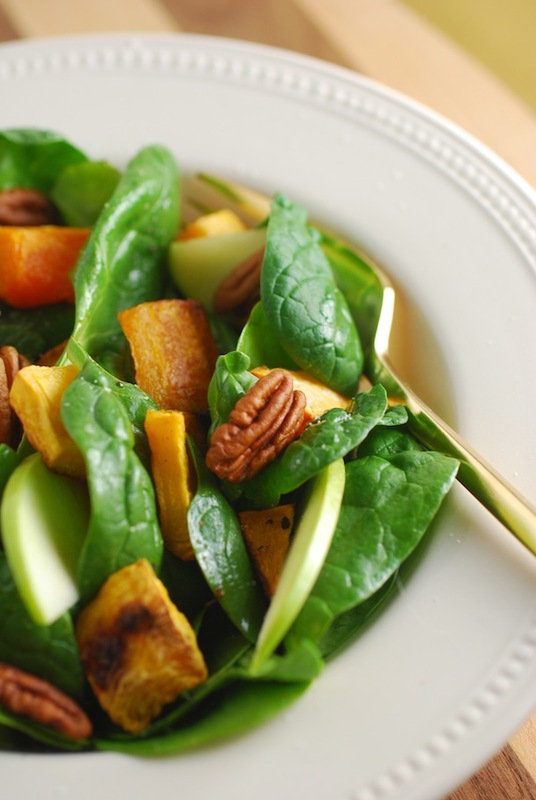 And a big Spinach Salad with Roasted Butternut Squash, Pecans, and Apples. This salad has become one of my staples this Fall and I love serving it to company since it's so easy, but packs a lot of flavor. Although I usually like to try and make EVERYTHING, I decided to take it a little bit easy this year, and let my friends handle dessert. My brother-in-law, who lives in Brooklyn, stopped off at the super popular Four & Twenty Blackbirds shop and picked up one of their famous Salted Caramel Apple Pies to share with the group. While not required, I always like to try and send my guests home with a little homemade party favor. For this party, I made a huge (HUGE) batch of Spiced Pumpkin Granola studded with dried fruits and white chocolate, and gave a little bag to each guest as he or she left. And, because, I always love to end the night with something warm, I slipped into the kitchen as the last guests left and made Eugene and myself a couple mugs of Pumpkin White Hot Chocolate spiked with a bit of Smirnoff Vanilla Vodka--the perfect thing to sip while cleaning up! I always try to do everything myself, but that just leaves me tired and I usually end up forgetting something. Instead, farm out some of the tasks that you're less interested in. Don't like to bake? Have a guest handle dessert or order something from a nearby bakery. Or get your buddy who is a wiz behind the bar to handle mixing cocktails. I wish I had a huge dining room and table to gather my friends around, but for now...that's just a dream. So I make my parties buffet-style, setting the food up on a side table, and letting guests serve themselves, and then gather around the coffee table on couches and mix-matched chairs. It's not perfect, but it's cozy and fun, which is all that really matters. This is one of my favorite entertaining tips. Instead of trying to man a full bar AND make sure dinner gets on the table, just choose one or two signature cocktails for the evening and prepare them in advance. That way when guests arrive, you just have to pour and serve. Easy! I also like to leave out a few staples like tonic, club soda, and sliced limes, along with a couple different flavors of vodka so folks can mix up their own basic drinks if they prefer. When it comes to proper Thanksgiving, most of the menu is usually set from year to year (and often completely out of your hands). But Friendsgiving? That's all you! Keep your favorite dishes, and get rid of the ones you don't love. Not a fan of turkey? Then don't serve it! Go with a ham or fabulous pasta dish instead. Or make it a potluck and let each of your friends bring a dish that they love. There is no right or wrong way. Call up your oldest friends, your cool neighbor, your favorite coworkers, or that girl you always chat with at yoga class and kind of wish you could hang out with more. Friendsgiving is a great time to bring together friends from different parts of your life. Want more great Thanksgiving entertaining ideas? Click on over to my Friendsgiving Inspiration Board on Pinterest! Note: This post is sponsored by Smirnoff. Thank you for supporting great companies like Smirnoff that make it possible for me to keep creating fun new content for you to enjoy. All photos, opinions, and recipes are (of course!) my own. As always, please remember to drink responsibly!